Robert Pinsky, 2007. From GET LAMP. 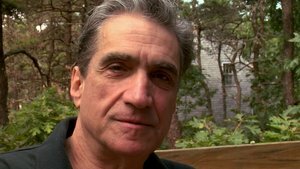 Renowned poet Robert Pinsky is interested in interactive literature, has compared IF to poetry, and wrote a text-adventure game in the mid-80s. He was the US Poet Laureate from 1997-2000. Mindwheel (with programmers Steve Hales and William Mataga; publisher: Synapse Software; 1984). "The Muse in The Machine: Or, The Poetics of Zork." New York Times Book Review, March 19, 1995: 3, 26-27. "Computers and Poetics." MIT Media Lab Colloquium, Cambridge, Mass. February 5, 1997. GET LAMP: Robert Pinsky. Interview clips of Pinsky for Get Lamp, 2007. This page was last modified on 19 June 2012, at 14:48.